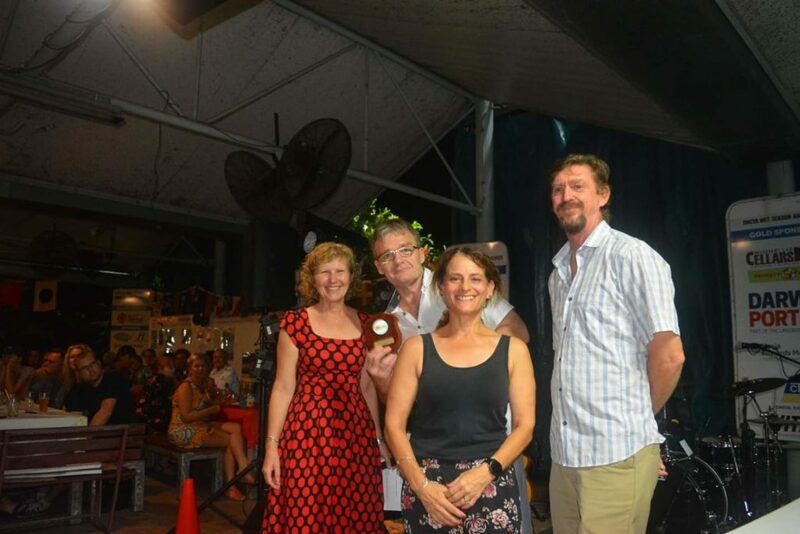 Presentation Night 2018-19 Wet Season Race Series. 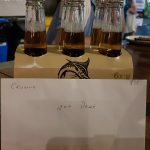 It was a great vibe at Dinah Beach for presentation night. 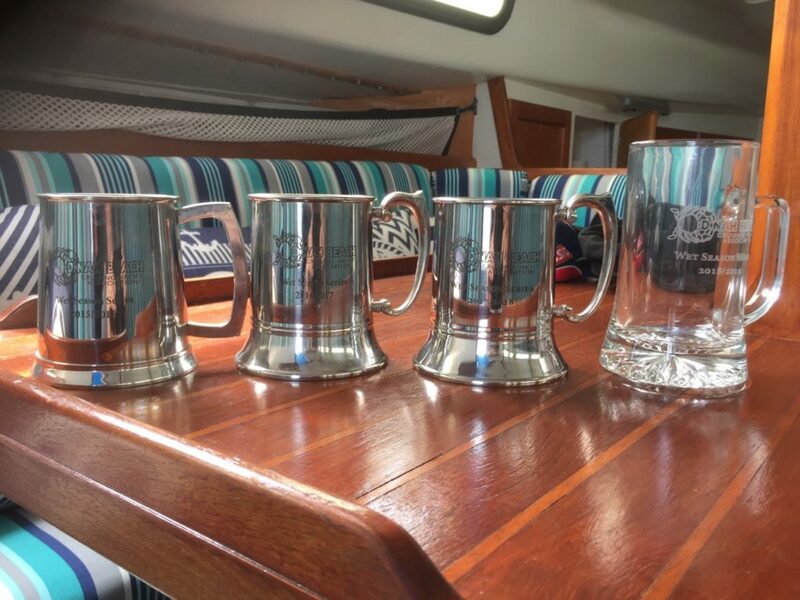 All participants show tremendous support for each other and there is a sense of camaraderie among sailors and would be sailors. The event organisers and volunteers are to be commended for their commitment in organising the route for each race and presentation events. Emma Ward has been involved for the second time in the wet season race series. We enter each race with the intention of refining and bettering our own skills. 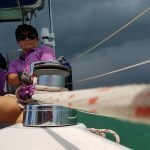 Whether that be trimming the sails, co coordinating putting up and taking down of the spinnaker and of course gaining experience in helming through a variety of weather conditions. Whatever the outcome, every day on the water is a good day where we learn something. Our crew have been fantastic. 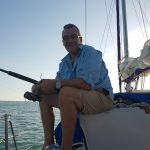 Greg has sailed with us every year and continues to pass on his skills and knowledge. We have had many friends join us for race day. Hopefully we will inspire enough of them to become regulars for race day. We were very surprised that Emma Ward won the most improved trophy. Well done everyone. Crew numbers were down for this race. 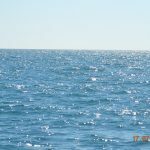 The weather was good with a forecast of northwesterly at 10 to 15 kts and seas about 1 meter. Approaching the start line we were about 20 seconds too early and so had to do a 360 turn. We crossed the start about 2 minutes behind the rest of the field. However, Emma quickly made up this ground and we hit the front after the first mark. 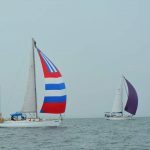 After the second mark there was a long spinnaker run, so out came the purple monster. due to the limited crew we had some issues getting the kite flying but eventually got it up. Safely across the finish line but with a massive storm fast approaching, the order was given to drop the sails as quickly as possible. It was not a moment too soon. the storm hit us like a sledgehammer. 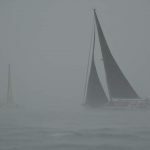 Visibility was down to about 20 meters and the wind was gusting between 35 to 40 kts. We had the motor going but the force of the wind meant we stayed in the same spot. Whilst some of the crew kept safe below. Captain Peter remained at the helm, with Greg keeping a good lookout to make sure that all other boats were clear. The storm lasted about 45 minutes and the it eased off enough to allow us to head back to Bayview. Next race in two weeks and hopefully the weather will be kind. Amidst the storm, there was time for birthday cake. Happy birthday Kathy. The first race for the new year and we are feeling refreshed, happy and ready to be back on the water. Skies are clear, slight breeze, five crew on board, should be a fab day. 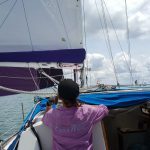 Our numbers were bolstered by the addition of Scott, an experienced sailor who had made Emma’s new head sail, main sail and her beautiful purple spinnaker. 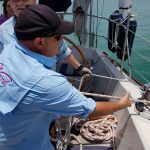 It was great to have him on-board so we could learn new skills and he could check out how the sails performed. The wind was from the north west at about 9 kts. 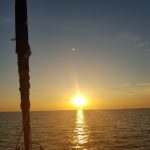 All is well and going fine, we are approaching the start line head on and looking likely to be first boat across and to head for the first buoy. We are getting kinda too close to the start line with a minute to go for the start and so bare away to head in a more horizontal direction. We then tack to cross the start line, the start signal blows, all good…..until race control calls on the radio..’Emma Ward, you have crossed the start too early’. We reckon we crossed about 5 seconds too early. This means we have to turn around and re cross over the start line. 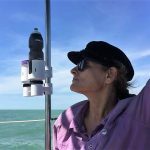 As we do, all of the other boats pass us going towards the first buoy, the wind is behind us and drops to about 5 kts relative so it seems to take a long time to re cross that line. As we finally cross the start line for the second time all the other yachts are just shy of the first buoy and we all felt a bit deflated. Making the most of the situation and on Captain Pete’s orders, we’ve refocused from winning to catching up with the rest of the field. I reckon we were catching up by the time we reached the second buoy. Crew was on the ready at all times. 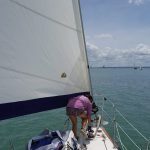 This time, under Scott”s expert instruction we put the spinnaker up before furling in the head sail, and it worked a treat. We kept forward momentum, kept those sails rightly trimmed and before we knew it, we had made up ground. Emma Ward was like a racehorse at the final turn. She sensed the open water ahead of her. She surged forward leaving the other boats in her wake, and sliced through the water with all hands feeling elated. For the rest of the race we maintained the gap on the field and crossed the finish line in first position. Well done to the crew who never gave up despite the overwhelming odds. It just goes to show that even if you have a bad start, you can make up ground by concentrating and not giving up. A great attitude to encapsulate into one’s daily life. Race 4 : Emma Ward came second over the start line this week. 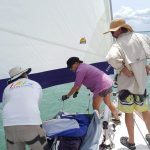 Crew raced really well, conditions were quite windy so it kept us cool on a hot humid wet season day. 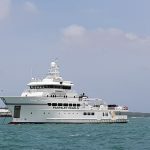 It’s not often we see the Paspaley Boat out in the harbour. This concludes sailing for 2018. We’ll be back with race 5 in early January. 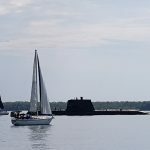 Race 2 2018/19 No wind in our sails race. 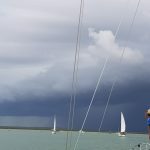 As we motored out of the lock and into Darwin Harbour for race 2, it looked as if it was going to be another stormy race and that we wouldn’t need our spinnaker. Tropical weather can be a tad unpredictable, as we keep founding out. 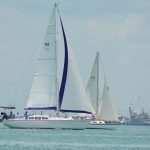 No wind, no spinnaker, inactive crew equals race postponed. 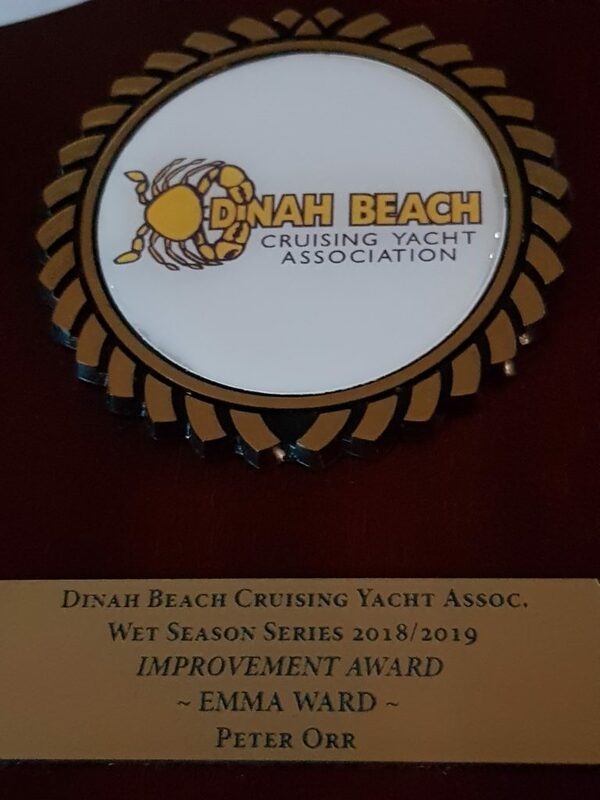 First race of the 2018/19 Dinah Beach wet season racing. Crew all shirted up and ready to roll. The conditions for the first race look good. A chance of rain, but the weather forecast will always say that for the wet season. We were practicing getting our timing right for the start of the race when boom, the heavens opened. 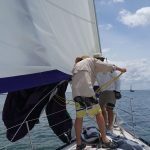 Winds dramatically increased so we reefed both main and head sail. Thanks to Captain Pete who remained cool, calm and extremely collected we managed to start the race, albeit late but we crossed that start line. ‘you can never have too much purple”. Did I mention we got second place! 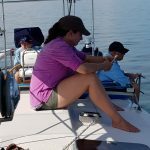 Since we’ve taken up sailing and owned Emma Ward, our goal has been to get out once a year for an extended dry season sail. 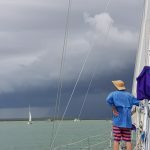 We really are blessed living in the tropics, as the weather is so predictably gorgeous and sailing conditions are perfect. Last year we sailed to Dundee and Crab Claw Island. 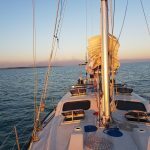 This year we decided to push ourselves a little further, to go somewhere new and head around to the Peron Islands. 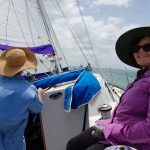 We had a chat to our new neighbours at the Marina, who advised us of safe anchoring spots and directed us to a website called yachtingaustralia.com.au which was most useful in providing essential information on the sailing passage for our trip. 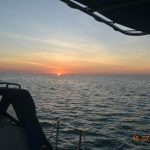 Leaving the marina at 1530 for a very cruisey standard sail to our spot outside the Darwin Sailing Club. A great start to our trip. 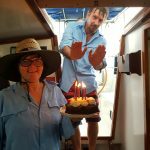 Day 2 Fannie Bay to Bare Sand Island July 15th. Spirits are high and ready to hoist those sails after our protein packed Captains breakfast of bacon and egg toasted rolls. Alas, no wind. Bugger. We motored for the bulk of the day. We were keen to use the water maker, so once anchored we would happily make some water and keep those tanks topped up. Well, it wasn’t to be, after much troubleshooting, we realized the water maker primer pump wasn’t operating. Having enough water is one of my “things”. We were carrying extra water but I’m still mindful of how much water is used. Funny, how you can have all this water surrounding you but not able to access it. Oh, and the sail stop was missing. Am pretty sure we dropped the main too quickly yesterday and it fell out. Finally, we get some decent winds to try out this new boom bag and lazy jacks layout we had just installed. I wanted to experiment with keeping the lazy jacks up or tucking them away as well as how much tension to keep on the boom bag. Sails are up and we are cruising very nicely for the morning. Great job. I’ve had some helm time, everything is going great guns. Until, the lazy jacks break. Crap. Not good. 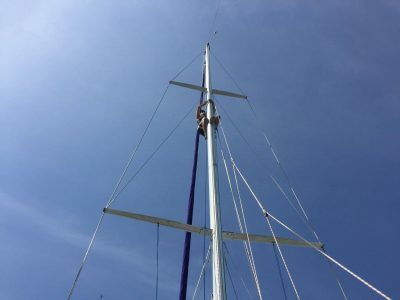 I was sure that when I ventured up the mast to tie them on, I had made a very secure bowline. We needed to reef the main. A very tricky task when winds are over 10 knots and there are no lazy jacks to hold the sail in place. We managed to work out a system and got the job done as best we could. I was quite annoyed with myself and couldn’t understand why both lazy jacks had failed at exactly the same time. The day was saved by four dolphins who decided to swim in our bow wave. Yesterday had been quite a long and taxing day. 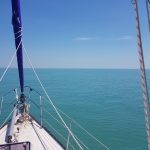 After much deliberation, we decided that since we had come this far, we may as well make it to the anchorage at Peron Island South. I think we needed that great sense of achievement to reach a point where we hadn’t been before. 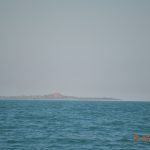 So, up went the spinnaker from Point Blaze to Peron Island North. Wow, she sure looks mighty fine. The winds had dropped to five knots, as we sailed into our anchorage for the night at 1730. Sure, it was going to be another long day, but when you are doing what you love, it’s not a chore. Winds were 10 to 15 knots for most of the day and Emma Ward was adept at sailing herself. Those sails were so perfectly balanced we didn’t need George (our auto pilot) or hands on the wheel. A beautiful day sailing indeed. We anchored at Dundee by 1830. 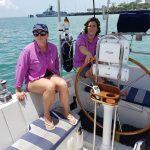 Mental note – check the bilge pump. It seems to have a mind of its own now. Yep, another early start. Out here, living your passion, it really doesn’t matter about 5am starts. Sailing early is quite refreshing. Watching the sunrise with a warm coffee and clean fresh air around you. The ocean is calm. The water has that certain glow. It’s a great time for early morning reflection and gratitude. Captain tightened the stern gland, after finding far too much water in the bilge. That was why the bilge pump kept coming on yesterday. I had the helm, great team work. We managed to get the sails up for a few hours and made a grand entrance with the spinnaker into our favourite Fannie Bay spot. Teacher By Day, Sailor By Desire. I have these memories of primary school, where the teachers used to have us play this game called ‘Port and Starboard’. I never really got the gist of that game. I would stand somewhat in the vicinity of the teacher as he called out ‘port’ and pointed to an area of the room where all the children would run to. Then ‘starboard’ for the same effect. In my confusion, I would take a couple of steps in the direction that a majority of the class had run off too, so at least I kinda looked like I knew what I was doing! The teacher could have been speaking double Dutch for all I knew – I didn’t even know my right from left!!! Fast forward many years to the present. Notwithstanding that some days I still have difficulty differentiating my left from right, the parts of a boat make more sense to me now. Thank goodness! I fell into sailing by way of meeting my partner. He had a 27ft Mottle when we met. For our second date, he took me out sailing. I had absolutely no idea what to expect or what to do. What will I do when he realises I forget my left from right? I was more concerned about that than falling off the yacht. Sheets, cleats, Genoa, oh my. So many many things to learn. Why does everything little thing have a name? 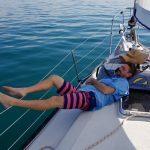 Main sail, reefing points, slugs, sliders, clew, halyard, outhaul, winch, just to name a few. Don’t even get me started on the knots. Well, persistence and resilience are my middle names and I got there. From that first time on a yacht, it felt good. It felt like home. Every time those gates to the lock open, that mighty sense of freedom overwhelms you. When we get out of the channel and the sails are hoisted, the engine is finally turned off and its just you and the elements. Nothing else matters. That, right there is my favourite moment. 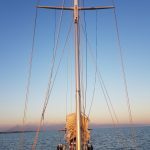 The wind catches the sails, the yacht has a steady cruising speed and the sound of the bow wave is pure bliss. Now, I am the proud owner of a 43ft Cavalier Sloop. She is big and she is beautiful. She came up for sale and just went to ‘have a look’. Let me tell you something, when an item has been price reduced and you go for ‘a look’, that there is a dangerous combination. 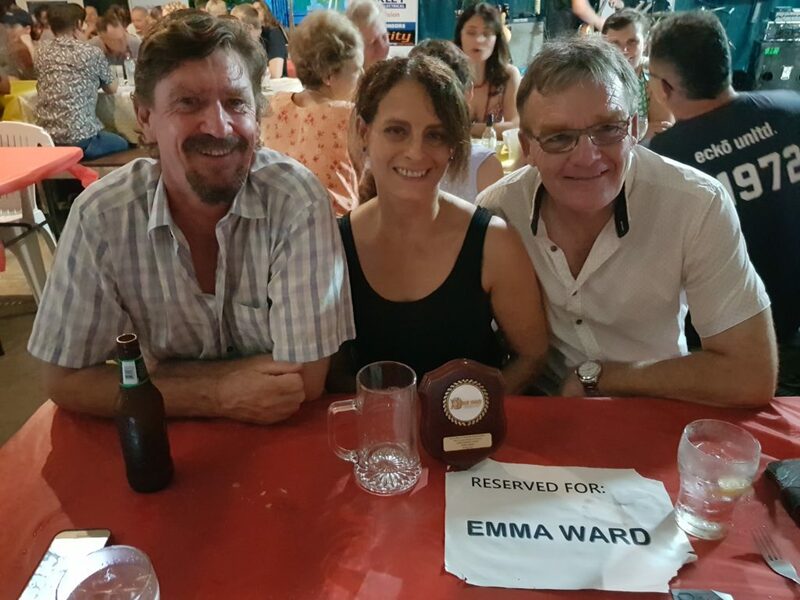 Emma Ward felt comfortable and homely. She fit like a glove. I just had to have it. The dream of selling up the land life for that of the sea is fast becoming a reality. A goal has been set. A date marked on the calendar. Every time I need to make a decision, it is with the knowledge that I will be selling up and living a sailor’s life. Oh the adventures to be had. 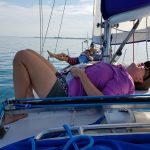 So far around the coastline of Darwin, Australia we have sailed with the dolphins seen turtles and an abundance of birds and flying fish. I love the unpredictability of each sail. Our monsoonal wet season in the tropics can be a testament to that. Hanging on to the boom in rough weather whilst trying to reef. 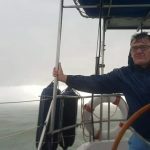 Clinging to the mast to untangle a sheet, glasses so smudged and fogged up, wet from the rain but not feeling the cold because the adrenalin rush takes over as you do your best to rectify a situation to keep sailing. Thinking on your feet. Being so aware of the surroundings. What’s the swell like? How are the clouds forming? Do they show signs of rain? Where’s that weird noise coming from? The yacht precariously tilted on one side, yet never once feeling as if it would flip over. 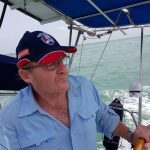 Sights are set on a circumnavigation of Australia, then watch out Northern Hemisphere. No time limit. Just one incredible sail to see the world from an ocean view. Oh, and I have learnt my right from left now. When you do something every day, it becomes automatic. Follow Emma Ward on – Instagram emma_ward_88. Look her up on Facebook, ask to be her friend and I will confirm our friendship. I look forward to continuing our journey together and share our love of adventure and sailing. So, Emma Ward was fitted with a new boom bag on Friday. A very nice fit indeed and the colour match to the headsail is halfway to making her new look complete. So, with that comes a new configuration of lazy jack lines. 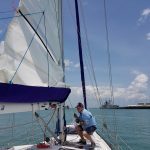 Captain and I discussed some configuration options with Scott the sail maker and made a mental list of what we needed to purchase in order to get the job done. We had a diagram to go by so we could double check everything that night. After much studying and discussing, we had it all worked out. Then came that look. The look you get when the Captain gives orders without saying a word. The look that says, ‘it’s your turn to go up the mast’. Damn it. It was my turn. Captain had been up the mast to fix some lines in our early days of ownership. I remembered saying that to keep things fair, I would have the next turn up the mast. Damn it. Off to The Yacht shop we went. We needed two new swivel blocks and some new line for the lazy jacks. Well, there was no point in stressing about it. Thank goodness it was a calm day. On went the safety gear and up, up, up I went. Pockets stuffed with equipment needed and my phone tucked into the front of my shirt for that all important birds eye photo of our boat. I was a little shaky, understandably. After all, I have difficulty mastering a common step ladder! A few deep breaths, telling myself to stay calm, I did what was needed to be done. I had to cut the old lazy jack line which was attached to the mast on a saddle. Then attach the new line and thread it threw the swivel block, pass the line down the mast and repeat on the other side. I must have been up there for at least half an hour. I can tie a bow line no problem on deck yet when it comes to tying one under a slightly stressful situation, it takes me a tad longer. I didn’t get that birds eye shot. 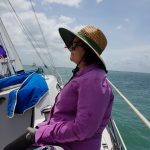 I was clinging so tightly to the mast, I just couldn’t manoeuvre myself around to comfortably take the phone out of my shirt front. I was actually more concerned about dropping it. Whilst up there, I did have one thought about clothing. Pockets were kind of useless when you are sitting in the Bosun’s chair. You can’t really get your hand in the pockets, or even wriggle enough to assist. So, I stuffed as much as I could into my shirt front and let my bra hold it all in place. Very handy storage indeed. Right, so we’ve both been up the mast now. I guess next time a job needs doing, we will have to draw straws. Copyright © 2019. All Rights Reserved Emma Ward.